Road Runner Girl: Santa Run Recap and a WINNER! Knee Update: A lot of you are asking how my knee did in Sunday's half marathon. I am happy to report that it did so much better than I expected!!! I will tell you more in my race recap later this week! ;-) I went to see Dr. Justin yesterday (I've been seeing him twice a week for treatment) and he was very pleased with the progress my knee has made in the last two weeks. 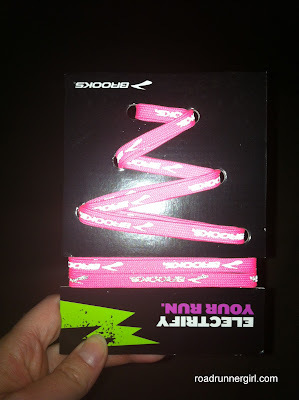 He gave me the go ahead to continue marathon training and run my 20 mile run this weekend. But he wants me to run/walk the 20 miler and ease off if I feel any pain in the knee. I will see him on Thursday and he offered to tape my knee for the 20 miler. He is so awesome! I 100% recommend him to any of my local peeps for any injuries! I am amazed how much he has helped me in just 2 weeks! This weekend I headed to Baton Rouge with Larisa at Zero to Twenty Six Point Two, Shannon (a fellow Sweat Pink Sister), and Melanie (a friend I used to teach with). 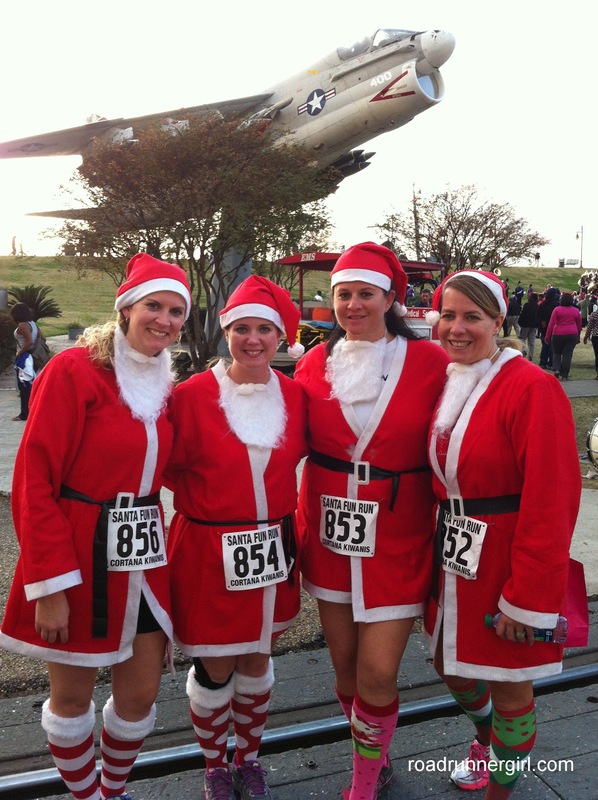 We were going to run the Woman's Half Marathon on Sunday. 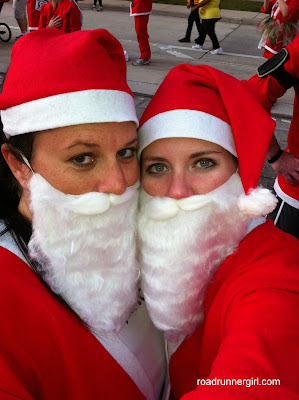 A few weeks ago I get a text message about a Santa Run the night before the half. How fun would it be to dress in a Santa suit and lead the Christmas parade in downtown Baton Rouge??? Although it sounded like so much fun...at first I said no due to my knee injury. But after some super convincing from Larisa and promising that we would only walk it (so as not to hurt my knee before the half) I went ahead and signed up. 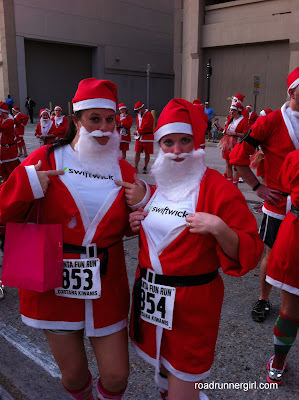 Luckily one of Shannon's friends who lived in Baton Rouge and was doing the run too was able to pick up our Santa suits and bibs for us on Friday. The weather Saturday was hot! The temperature was in the high 70's. And the Santa suit....was heavy felt! We were not too excited about that because we knew we were going to be burning up! The suit came with pants, a jacket, a belt, a Santa hat, and a beard! And the sizes were HUGE!!! You could have fit two of me in the pants!!! We all decided to not wear the pants and instead sport our cute Christmas socks...yay! I also had my red and white dot running skirt but it didn't matter because the jacket covered my skirt completely because it was so big! 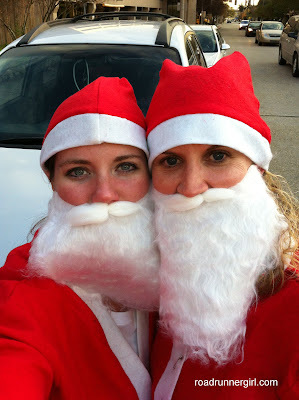 We all felt a little ridiculous in our Santa suits but we knew it would be fun! The race was supposed to start at 5PM but it ended up not starting until 5:15. 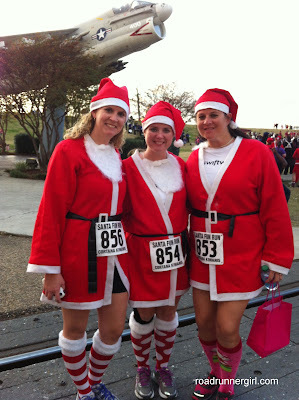 It was fun seeing everyone wearing a Santa suit! 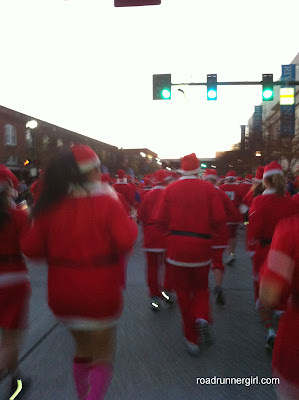 There were even little kids wearing Santa suits! And several families participated...and decorated their stroller with Christmas lights! So cute! My favorite part of the race was all of the people lining the street waiting on the parade! There were tons of kids and they were so excited to see all the Santas strolling down the street! I gave so many high fives to kids and I loved every minute of it! I even heard one say, "Santa just touched my hand!" So sweet! 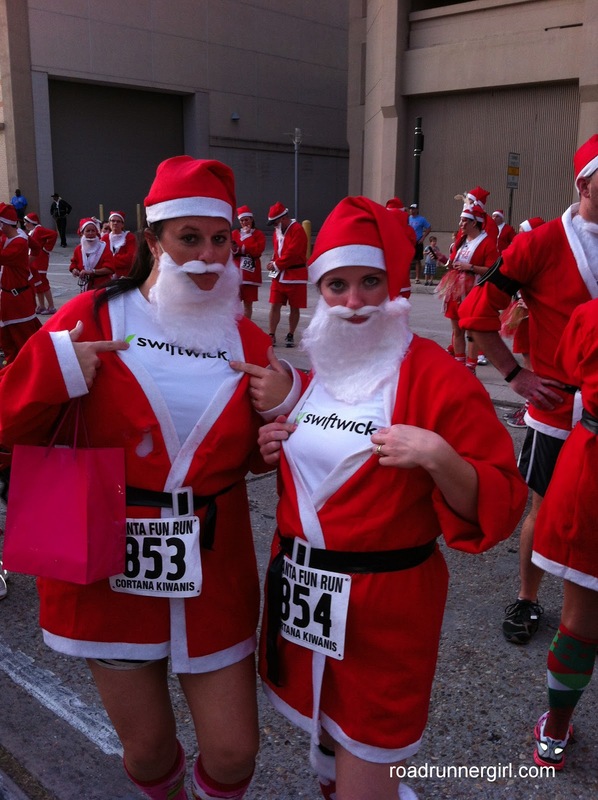 We originally thought this race was a 5K...but it was really just under 2 miles. That was fine with me because I didn't want to tire my legs out too bad before the half the next morning. At the finish their was a DJ playing music as well as water, cokes, and beer. They also handed us a goody bag with candy canes, a Christmas lollipop, and some Brooks shoe strings! Sweet! Running in a Santa Suit! Race communication was very poor. The Facebook page only gave information for the race in New Bedford, MA which was the same day but at 11AM. Poor website. Same bad communication. 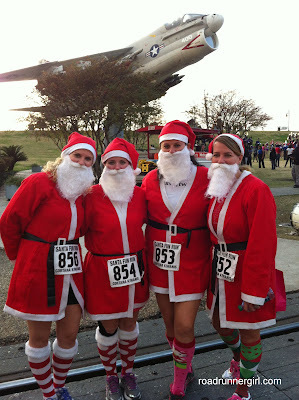 The website advertised the Baton Rouge race but I couldn't find hardly any info about the race. There wasn't a route, we had no idea if it was a 5K (although it clearly stated the New Bedford race was), and I couldn't even find a start time. Congratulations!!! Please email me your mailing address at mindy@roadrunnergirl.com! 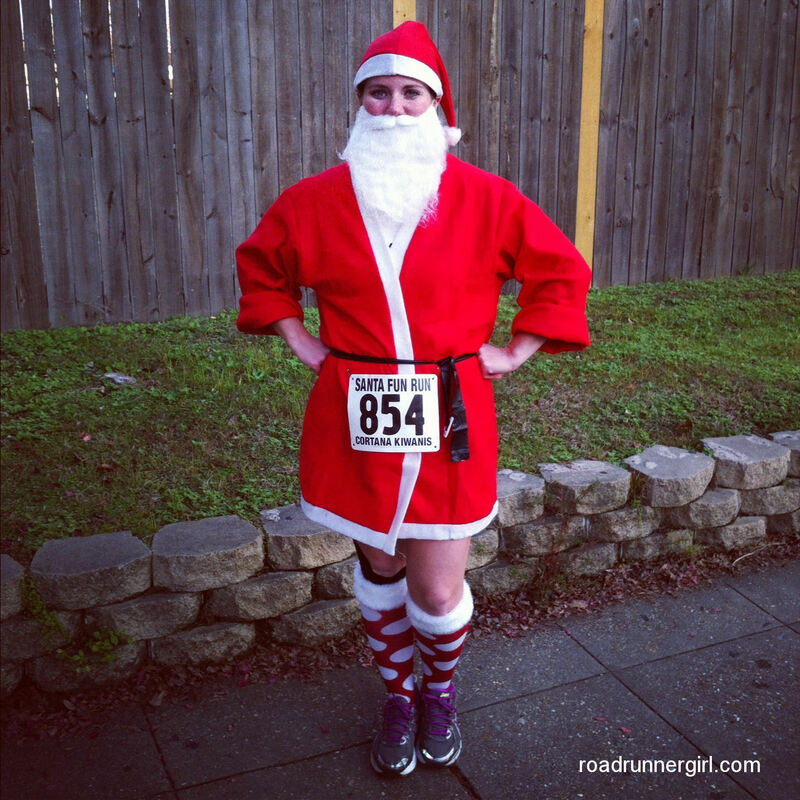 QOTD: Have you ever run a race in costume?